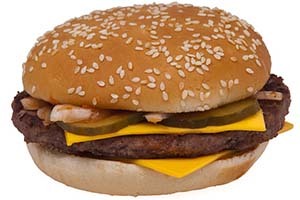 An American man ate his 30,000th Big Mac last week. Don Gorske, age 64 from Wisconsin in the United States, loves McDonald's burgers so much that he eats two every day. For Don, they are his "perfect food". He started eating them in 1972 when he got his driving licence and could drive to his local McDonald's restaurant. Since then he has eaten them every day except when his mother died. Don even proposed to his wife in the car park of a McDonald's restaurant! Now Don holds the Guinness World Record for eating the most burgers. Do you think Don is right to eat fast food every day? Or should we try to eat a healthier diet? That is so stupid ! Ahahahah it’s so crazy man..
46 Years of eating big mac every day.. Is his stomach still good? Even if someone can, it will one day seems not as good than before, because of eating it too much..
this man is crazy and bravo for this. Wow, very interesting post ! I think it’s a very interesting post ! I think this man should eat healthier. I think he shouldn’t eat so much fast food for his health and also for his shape.Don’t you agree? In 2014, water consumption per person per day was the highest in Dubai. In the United States consumption is the second largest in the world. In fact, the average daily consumption per person in Dubai is around 500 liters. In the United States, it is 295 liters. Japan completes the podium with an average consumption of 278 liters. I love your text !!! But is not good for him to eat fast food every day. He should eat healthy !